I’ve been scoping out some of the large hotel aggregators loyalty programs in recent weeks, and will be writing up some of the different features of each in coming guides. The benefits of being loyal to an aggregator over a specific chain are pretty clear – you get to try and accrue stays or nights towards benefits in many more hotels than just a single chain offer. 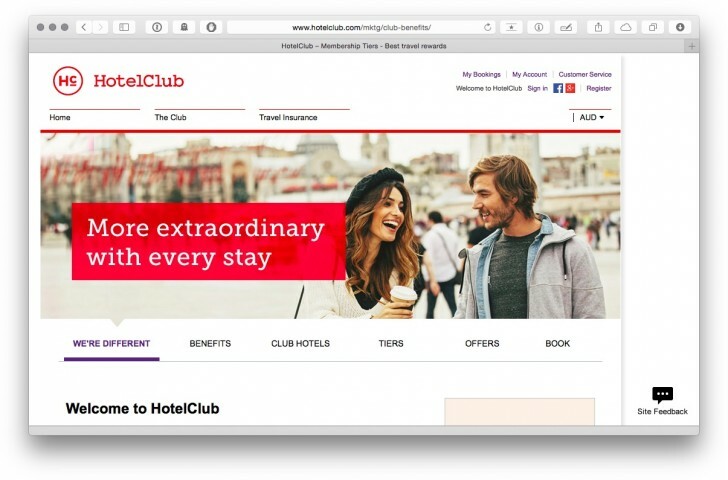 However, on the flipside, often the aggregators can’t reward loyalty with upgrades and other benefits during your stay – but it seems like HotelClub are trying to address that with their offering. Recently HotelClub have relaunched their loyalty program, Member Rewards, and I thought I’d start there. They are also currently offering some discounts of up to 40% off for members across Australia, New Zealand and Fiji. HotelClub.com is a Sydney-based, but globally focused business who are owned by Orbitz. In terms of their hotel offering, they are similar to the other large hotel aggregators out there. This is part of the challenge for businesses like HotelClub – when many people are shopping on price and looking at essentially the same product, trying to find ways to offer a USP to gain loyalty out of customers becomes increasingly important. HotelClub’s loyalty program is Member Rewards – benefits are applied on a simple tier system based on the number of stays you make within (quite a wide) 24 month period. You can sign up for HotelClub Member Rewards here. I also received a 15% discount by email offer within a couple of days of signing up. The headline benefit is an immediate rebate of credits to your account, as a percentage of the value of the stay you’ve booked. You can then apply these credits to future bookings. If you’ve made 1-2 stays, you’ll be in the door at Silver status. This offers 3% rebate for website bookings, or 4% for mobile app bookings. If you’ve made 2-5 stays, you’ll earn Gold – this kicks back 4% for website or 5% for in app bookings. And if you’ve made 6 stays or more, you’ll be at Platinum – offering 5% on website bookings or 7% for in app bookings. Why the differential between app and website bookings? Customers who book through an app can’t have been referred through another site (like Point Hacks!) that HotelClub has to pay commissions to, meaning they can offer customers a higher rebate. 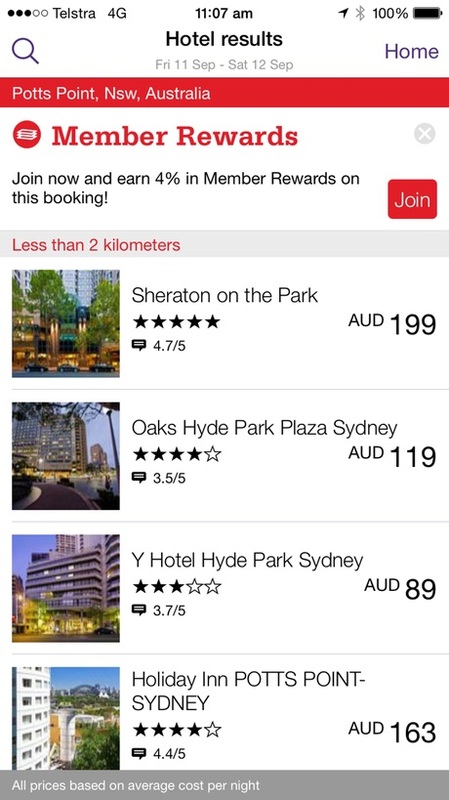 So to earn the biggest rebates, you’ll need to target more of your stays through HotelClub, and book in the app. Pretty simple. Gold and Platinum status should be relatively attainable given the 24 month status window, and relatively low stay requirements. The headline benefit for Gold and Platinum members, outside of the rebate, is a room upgrade during stays at one of the 1,100 ‘Club Hotels’ that HotelClub work with to deliver additional benefits for Member Rewards members. You can check out the hotels included in as Club Hotels is here. Generally the really big chains (Starwood, Hyatt and co) are not included, but some of the second-level players are – in Sydney for example there’s The Langham, Vibe and Radisson Blu, or in Melbourne the well-rated Art Series group. Club Hotels also offer some soft benefits for Gold and Platinum Member Rewards – these vary at each hotel, and include benefits such as late checkout, a bottle of wine, breakfast for two, parking or free wifi. The actual value of these is obviously going to vary at different hotels. How does this compare to other hotel programs out there? In terms of alternatives to Hotel Club, I’m most familiar with Hotels.com Rewards. I will look at this program in more detail in another guide, but the key difference is the earn model – stay 10 nights, and you’ll then earn 10% of the total value of those 10 nights back in credit. So while the headline benefit is a larger discount for Hotels.com – it will take more nights to attain and not all hotels are eligible to earn Reward nights. Hotels.com benefits outside the discount are also more limited, with all benefits being virtual – access to priority customer service and early sales, and not much else. There’s also Expedia+ rewards which has recently relaunched. Expedia have made their program a complex beast – but boiled down to the discounts, the rebate on hotel stays for standard members is 3.5%, increasing to nearly 5% for top tier Gold+ members. 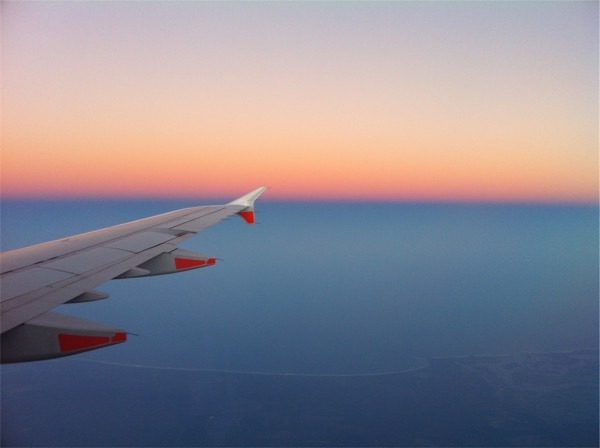 However you can also earn credit for your flight bookings through Expedia as well. Finally, there are then other frequent flyer points earning options like Agoda (for Velocity points), Kaligo, Rocketmiles and Pointshound. The model for these is different – most of the time you’ll trade off the discount available with programs like Hotels.com Rewards and HotelClub Member Rewards for the ability to earn points on your booking. With the points earning hotel aggregators, you’ll definitely need to weigh up the value of the points you’ll earn versus the price of booking in other channels – prices can be competitive, but often you’re paying a little more to earn some points with your booking. What I like about the Member Rewards program versus some of the competition? What’s your take? Do you have a preferred hotel booking method, and why? don’t get caught up with sticking with one site though. Booking.com or hotels combined can sometimes through up a great deal.